She was arrested in Vancouver on 1 December, but was granted bail by a Canadian court several days later. A judge in Canada’s western city ruled that she would be under surveillance 24 hours a day and must wear an electronic ankle tag. Ms Meng is accused in the US of using a Huawei subsidiary called Skycom to evade sanctions on Iran between 2009 and 2014. She denies any wrongdoing and says she will contest the allegations. US President Donald Trump has said he is willing to intervene in the case. 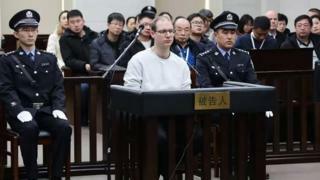 The arrest came against the background of an increasingly acrimonious trade dispute between the US and China.